Acid stain is a unique stain in that it chemically reacts with the lime in the concrete and therefore causes the concrete to change color. It is not on it or in it, the concrete has changed by chemical reaction and this is why we can get such beautiful stone-like patterns. The application technique is very important because the acid stain reacts immediately and any mistake is indelible. 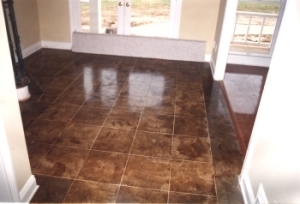 Add SAW CUTS to your acid stained concrete floors for a distinctive look.